Happy Monday, friends! I hope you had a nice weekend. A very unusual cool front swept through Atlanta so I spent most of my weekend in light jackets. Not that I'm complaining - I've never really enjoyed the summertime high heat and humidity we usually have. Have a wonderful week! Ooh, stripes and giraffe print together. Genius! Very nice combo and classic color! Awww. 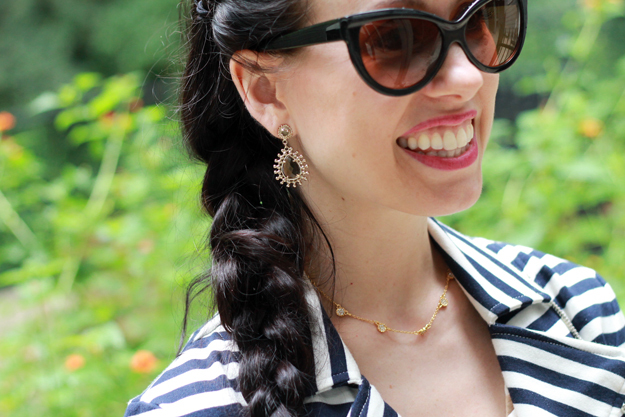 I never realized that navy blue striped and giraffe print go well together! Always a fan of mixing prints. Great summer look! You look so chic, such a nice jacket. Hi! I've just found your blog and have loved looking through all the posts. I was surprised to see that your natural hair color is quite a bit lighter than it is now. However, you are a lovely brunette! My own hair is not much off your current color, but unfortunately, I'm starting to notice silver threads. YIKES! Have you done a post about your hair color, products or process? I searched but couldn't find anything. I'd love to know how you keep such lovely natural looking shiny hair even though it is chemically processed.